It may seem like an unusual release but the origins of CBS’s only American Abba CD, its 1989 version of Gracias Por La Musica, are remarkably straightforward. In fact, the only real curiosity about this release is why CBS waited so long before issuing it. While most of Abba’s records were distributed in the US by Atlantic during the group’s heyday, Gracias Por La Musica and most of its associated singles weren’t. The reasons for this are unclear, particularly as Atlantic had released the Spanish version of Chiquitita as a single there in 1979. But, for whatever reason, all subsequent Spanish Abba records were released in the US by a CBS offshoot, CBS Discos International, which specialised in recordings targeted at the Hispanic market. These obviously included Gracias Por La Musica. 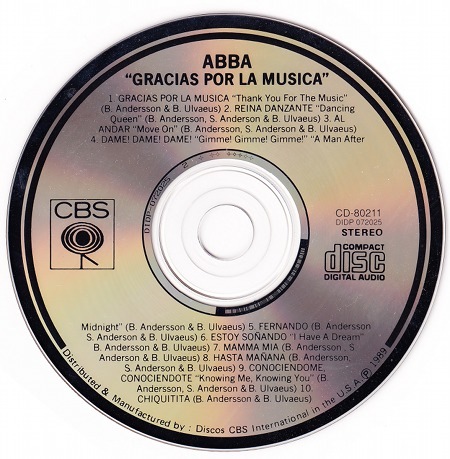 CBS’s deal with Abba’s record label, Polar Music, obviously wasn’t a short-term arrangement either, seeing as the label was in a position to issue a CD version of Gracias Por La Musica in 1989. Unfortunately, its timing was poor, given that PolyGram were already starting the process of winding down Polar’s international licensing operation, meaning that the title could only have been available for a brief period of time. It is now super rare and worth over €100. The CBS US CD version of Gracias Por La Musica bears a strong resemblance to its European cousins in several respects, most notably the fact that the front artwork is unusually tightly cropped, omitting the top and bottom of the airmail frame. catalogue number which is different to its European cousins. It can be distinguished at a glance from the European CDs because the back cover has a light blue background. Its catalogue number is also completely different. Interestingly, Abba discography sites tend to conflate the US and European CBS releases of Gracias Por La Musica and give the European catalogue number for the US version, suggesting that some European copies may have ended up stateside. Title in range: Gracias Por La Musica (CD-80211).